To Cite: Nasiri S, Shahbazi M. The Impact of Motivational Self-Talk on Motor Learning in Ten-Year-Old Male Students, Int J School Health. 2018 ; 5(2):e60890. doi: 10.5812/intjsh.60890. Background: One of the most important goals of physical education teachers and sport trainers is to increase the amount of learning and performance of motor skills of students and athletes in the shortest time, with the lowest cost and energy, and the highest level of motor skills learning. Therefore, teachers and sport coaches should use the best methods to learn and practice for better results. Objectives: The purpose of this study was to investigate the effect of motivational self-talk on the performance and learning of skills of throwing a tennis ball from the top of the shoulders with the use of the non-dominant hand in 10-year old male students. Methods: For this purpose, 40 male students (average age of 10. 17 ± 0.51) volunteered to participate in this study as the research sample and were randomly divided to 2 groups of 20 (motivational self-talk group and control group). In the acquisition phase, the subjects were trained continuously during 5 sessions for 5 days (6 blocks of 10 attempts per session) and on the next day, they performed a retention test with 10 attempts. To illustrate the difference between groups, independent samples t-test was used, while one-way analysis of variance was used to compare the scores of each group at each phase of study. Results: The results of the statistical methods showed that both groups improved at the acquisition stage and there was a significant difference between the groups at the acquisition stage (P < 0.001). In other words, results were in favor of the motivational self-talk group (P < 0.001). In the retention phase, there was a significant difference between the 2 groups, and this advantage was in favor of the motivational self-talk group (P < 0.001). Conclusions: In general, it is suggested for sports teachers and trainers to use motivational self-talk for improvement of various skills. One of the most important goals of physical education teachers and sports trainers is to increase the amount of learning and performance of motor skills of students and athletes in the shortest time, with the lowest cost and energy and the highest level of motor skills learning. One of the facilitating factors in this regard is the effective training of students and young people in physical activity and sports in a variety of educational settings, including schools, clubs, and sports centers. This is because it is believed that useful learning saves time, prevents waste of energy among learners, and guides them effectively towards achievement of more important goals, including the development in being a competitive athlete and gaining pride (1). Therefore, the teacher and the sports coach should use the best ways to learn and practice for better conclusions (1). In the meantime, for the successful performance of motor skills, the use of self-talk techniques that controls and organizes the athlete’ state of the mind is promoted and self-talk is considered as an indispensable factor in practicing or training skills (2). Self-talk is one of the most popular cognitive strategies and techniques that is widely used by athletes when learning sport skills or in a competition (3). In the recent years, numerous studies have been conducted on the effect of self-talk on sports activities (4). Researchers have implemented various designs in various sports fields and assignments and have found support for the effect of self-talk strategies on facilitating learning and improving performance (4). Self-talk strategies consist of 2 main functions: motivational and instructional (4). Motivational self-talk increases self-confidence, enhances motivation, reduces worries, and drives the person to expend greater efforts (4). Furthermore, it lowers energy expenditure and creates positive modes of performance (4). On the other hand, its educational function improves performance through focusing attention and provision of technical information, and creating appropriate performance instructions improves the execution of skills (4, 5). Empirical research has provided evidence for the effectiveness of motivational self-talk in sports activities (6-8). For example, Kolovelonis et al. (2010) in a research study showed that motivational self-talk improves the precision and accuracy of basketball pass skills in junior high school students (9). Tahmasebi Boroujeni and Shahbazi (2011) in a research study on the effect of educational and motivational self-talk on the performance of basketball throwing skills, showed that motivational self-talk is effective on the pass and shoots during a basketball game (10). Similarly, Tahmasebi Boroujeni and Ghaheri (2011) found that motivational self-talk reduced response time (11). Zourbanos et al. (2013) investigated the effect of self-talk on the dominant and non-dominant hand performance in handball tasks among elementary school students. The results showed that motivational self-talk improves the performance of handball tasks in both hands (12). Chang et al. (2014) examined the effect of motivational and instructional self-talk on the performance of the softball launch, and showed that both types of self-talk improved the softball throw performance. Motivational self-talk at higher distances had a great impact on the improvement of performance (13). However, in the studies of Theodorakis et al. (2000) and Goudas et al. (2006), self-talk was not found to be effective in learning throwing skills (14, 15). On the other hand, research has shown that motivational self-talk increases self-confidence and reduces anxiety (16). Further studies on psychological factors have shown that self-efficacy is one of the issues associated with self-talk and the reason for the effect of self-talk on performance and learning was the effect of verbal encouragement on self-efficacy (17). Self-efficacy also has beneficial effects on learning and throwing function (18, 19) and can increase motivation and confidence of the subjects (20, 21). Considering the controversial results about the effect of self-talk on motivation and performance of motor skills learning as well as the lack of research on the effect of motivational self-talk on motor learning in students over the age of 10 years, further research is needed to be carried out. In other words, the purpose of this research was to determine whether motivational self-talk improves the performance and learning of throw from the top of the shoulders with the non-dominant hand in 10-year-old boys. Regarding the effect of motivational self-talk on motor learning, no research has been done on the effect of motivational self-talk on children. Therefore, the purpose of this study was to investigate the effect of self-talk on learning of the throwing skill from the upper shoulders with the non-dominant hand in 10-year-old male students. To achieve the goals of this research, 40 male students (with average age of 10.17 ± 0.51) volunteered to participate in this study. They were individuals, who were right-handed, had no disabilities in their performing hand, had no gross visual deficits, and were all novices in the skill (throwing the tennis ball from the top of the shoulders). The a priori sample size was calculated using a software package, Gpower (statistical power of 0.80, with a large effect size, f2 = 0.80, a moderate correlation (r = 0.50), and an overall level of significance of P = 0.05) (22). The participants were randomly divided to 2 groups: The motivational self-talk group (n = 20) and the control group (n = 20). All participants provided signed versions of a parental consent form. The present study was approved by the office of education in Bonab and the University of Tehran prior to implementation. The task of this study was to throw the tennis ball from the top of the shoulders with the non-dominant hand. The non-dominant hand was determined through asking the participants whether they write with their right or left hand (23). 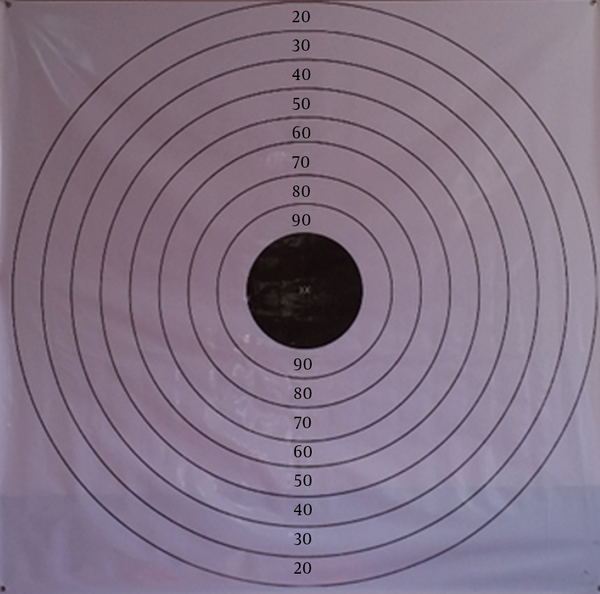 The tool used to measure the precision of throws was a shooting target fixed to the ground and consisting of 10 concentric circles with dimensions of 2 × 2 m. The center of the target was a circle with a radius of 10 centimeters and the other circles were placed with distances of 10 centimeters from each other. The target center score was 100 and shots to the other consecutive circles subtracted 10 point, respectively. The throws that did not hit the target were scored 0 and if a shot touched a line between the 2 circles, the higher score was calculated. The person had to aim for the center of the target in order to get the highest points possible. The target was placed within 3 meters of the participants (24). Subjects were randomly divided to 2 groups, motivational self-talk and control. Before performing the pretest, the correct movement was first taught to the subjects and was repeated by each participant. The groups were then pre-tested. The assignment consisted of 5 sessions for 5 continuous days (6 blocks of 10 attempts per session) of throwing a tennis ball from top of the shoulders with the non-dominant hand. After the pre-test and division of the groups, the subjects in each group practiced on their own conditions. The motivational self-talk group performed their exercises by the repetitive use of motivational words (e.g., “I can show to others how skillful I am” or “I can do it”) (16), while the control group practiced throwing without any motivational self-talk. The retention test was conducted after 24 hours without the provision of any feedback and self-talk in similar conditions for both groups. In order to study the normality of the data, the Shapiro-Wilk statistical test was conducted. Furthermore, to compare groups between their pre-test and retention stages, independent samples t-test was performed, and to examine the effects of the training program on the experimental and control groups within the acquisition stage, repeated measures analysis of variance (ANOVA) was applied. The mean age of 40 students was 10.17 years (SD = 0.51; range = 9.0 to 11.0 years) and mean of height was 135.54 cm (SD = 9.51; range = 119.0 to 156.0 cm) and mean of weight was 30.67 kg (SD = 6.09; range = 20.0 to 47.0 kg). There were no significant differences between the groups with respect to demographic data (age, height, and weight). Shapiro Wilk’s test confirmed the normal distribution of the data. Descriptive statistics for the groups at different stages of the test (pre-test, acquisition, and retention) are shown in Table 1. In the table, it is indicated that both groups have progressed compared to their pre-test with regards to the scores of throwing the tennis ball, although the motivational self-talk group had better scores than the control group. In the retention test, the motivational self-talk group also had better scores than the control group. 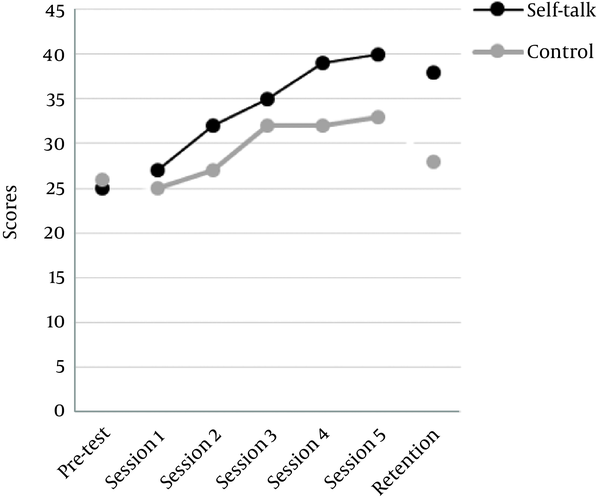 This means that the subjects in the motivational self-talk group at the acquisition and retention stages had better grades than those in the control group. Conducting independent samples t-test on the pre-test scores showed no significant difference between the groups (P =0.427). Table 2 shows the results of repeated measures analysis of variance (ANOVA) for acquisition stages. The results showed that the main effect of the group, the main effect of the stages, and the interactive effect of the group and the stages were significant and the results are in the favor of the motivational self-talk group. Furthermore, both groups at the acquisition stage showed a significant progression in scores. Table 3 shows the results of the independent samples t-test for the retention stage between motivational self-talk and control groups. The results showed that there was a significant difference between motivational self-talk and control groups’ scores and the results were in favor of the motivational self-talk group. Finally, the results of the self-talk scale showed that the groups used more self-talk in the form of “I Can” and “I Can Do” phrases. The control group did not use self-talk and had thoughts irrelevant with research. Since the interactive effect of the group and the stages was significant, this research performed a separate repeated measures analysis of variance (ANOVA) for each group. In order to investigate the within-group differences in the motivational self-talk group, regarding the fact that the assumption of Mauchly’s test of sphericity (x2(2) = 22.330, P < 0. 001) was not confirmed, the results of Greenhouse-Geisser correction procedure in the repeated measures ANOVA were reported and showed that motivational self-talk led to an improvement in the accuracy performance of overarm throwing (P < 0. 001). In other words, a significant improvement in the performance of the participants was observed from the pre-test stage (25.20 ± 4.56) to the post-test (40.25 ± 3.00) (P < 0.001) and retention (38.40 ± 1.84) (P < 0.001) stages. Also, the control group showed an improvement in the accuracy performance of overarm throwing (P < 0.001). In other words, a significant improvement in the performance of the participants was observed only from the pre-test stage (26.40 ± 4.88) to the post-test (33.05 ± 4.19) (P < 0.001) and not in retention (28.15 ± 3.08) (P = 1.000) stages (Figure 2). This study aimed at investigating the effects of motivational self-talk on the learning of a motor task in 10-year-old boys of Bonab. For this purpose, 40 right-handed students participated in the study and were divided to 2 groups of 20 (motivational self-talk group and control group) after conducting a pre-test. Acquisition steps consisted of 5 sessions (6 blocks of 10 attempts per session) of throw from the top of the shoulders with the non-dominant hand. A 2 × 2 target was used to measure the precision of throwing. After 24 hours of the acquisition test, a retention test was conducted with 10 attempts. The results of this study showed that the scores of both groups progressed in the acquisition stages. However, the motivational self-talk group had better scores than the control group. Furthermore, in the retention test, the scores of the motivational self-talk group were significantly higher than that of the control group. The results of this study are in line with the findings of previous research (9-12, 25). In these studies, the usefulness of the motivational self-talk method was confirmed by the accuracy of the ball launch to a specific target in the water polo, chest passes in basketball, sit-ups, pass speed in basketball, handball task, and softball throw. Since motivational self-talk increases the motivation of individuals (20, 21), and considering the fact that part of motivational self-talk’s function is related to the increase of arousal (4), increase in the scores of ball throws from the top of the shoulders could be attributed to the increased levels of arousal in the motivational self-talk group; one of the other reasons is the increase in student self-efficacy. Increasing self-efficacy can be the reason why self-talk is effective on performance (17). This finding could be justified by Bandura’s self-efficacy concept (1997), where the success of implementation and learning is regarded as resulting in self-efficacy. Bandura believes that verbal encouragement is a source of self-efficacy, which has a special relationship with self-talk. Verbal encouragement of the self can help the individual, in the form of motivational self-talk, and can increase self-efficacy during exercise and skill learning (26). Theodorakis et al. (2008) (27) and Hatzigeorgiadis et al. (2007) (28) in their research proposed that self-talk could positively affect performance via increasing attention to the task. In the present study the overhand throw task required precision and increased attention. Therefore, motivational self-talk helps children increase their attention and subsequently improve their performance. However, the results of the present study were not consistent with the results of Theodorakis et al. (2000) and Goudas et al. (2006) in the second study (14, 15). One of the reasons for the discrepancy between the results of this research and the research by Theodorakis et al. (2000) (14) could be the nature of the assignment in that study, which included sit up test, soccer, and badminton services. Furthermore, in the study of Goudes et al. (2006) (15), the nature of the skill, the age of the subjects as well as majoring in physical education resulted in different findings. In general, according to the results of this research, a suggestion is made on the effectiveness and usefulness of motivational self-talk technique on learning to throw from the top of the shoulders to the physical education-educated teachers and athletic instructors. In order to facilitate learning and to learn and retrieve the desired skills in the curriculum, the motivational self-talk technique can be applied. Meanwhile, it is suggested for this research to be performed on 10-year-old females and different sports skills in order to examine the results in different situations. The authors would like to appreciate the efforts of all parents, students, and teachers involved in the study, including Mr. Asghari and Mr. Nasiri, as well as the physical education department of the education office in Bonab for their cooperation during the current study. 1. Schmidt R, Lee T. Motor Learning and performance: from principles to application. 5 ed. Human Kinetics; 2013. 2. Hardy L, Jones JG, Gould D. Understanding psychological preparation for sport: Theory and practice of elite performers. John Wiley & Sons Inc; 1996. 3. Chase MA. Sources of self-efficacy in physical education and sport. J Teach Phys Educ. 1999;18(1):76-89. doi: 10.1123/jtpe.18.1.76. 4. Hardy J. Speaking clearly: A critical review of the self-talk literature. Psychol Sport Exerc. 2006;7(1):81-97. doi: 10.1016/j.psychsport.2005.04.002. 5. Chroni S, Perkos S, Theodorakis Y. Function and preferences of motivational and instructional self-talk for adolescent basketball players. Athletic Insight. 2007;9(1):19-29. 6. Mallett CJ, Hanrahan SJ. Race modeling: An effective cognitive strategy for the 100 m sprinter?. Sport Psychol. 1997;11(1):72-85. doi: 10.1123/tsp.11.1.72. 7. Donohue B, Barnhart R, Covassin T, Carpin K, Korb E. The development and initial evaluation of two promising mental preparatory methods in a sample of female cross country runners. J Sport Behav. 2001;24(1):19. 8. Harvey D, Van Raalte J, Brewer B. Relationship between self-talk and golf performance. Int Sports J. 2002;6(1):84-91. 9. Kolovelonis A, Goudas M, Dermitzaki I. The effects of instructional and motivational self-talk on students’ motor task performance in physical education. Psychol Sport Exerc. 2011;12(2):153-8. doi: 10.1016/j.psychsport.2010.09.002. 10. Tahmasebi Boroujeni S, Shahbazi M. The effect of instructional and motivational self-talk on performance of basketball's motor skill. Procedia Soc Behav Sci. 2011;15:3113-7. doi: 10.1016/j.sbspro.2011.04.255. 11. Tahmasebi Boroujeni S, Ghaheri B. The effect of motivational self-talk on reaction time. Procedia Soc Behav Sci. 2011;29:606-10. doi: 10.1016/j.sbspro.2011.11.282. 12. Zourbanos N, Hatzigeorgiadis A, Bardas D, Theodorakis Y. The effects of self-talk on dominant and nondominant arm performance on a handball task in primary physical education students. Sport Psychol. 2013;27(2):171-6. doi: 10.1123/tsp.27.2.171. 13. Chang YK, Ho LA, Lu FJH, Ou CC, Song TF, Gill DL. Self-talk and softball performance: The role of self-talk nature, motor task characteristics, and self-efficacy in novice softball players. Psychol Sport Exerc. 2014;15(1):139-45. doi: 10.1016/j.psychsport.2013.10.004. 14. Theodorakis Y, Weinberg R, Natsis P, Douma I, Kazakas P. The effects of motivational versus instructional self-talk on improving motor performance. Sport Psychol. 2000;14(3):253-71. doi: 10.1123/tsp.14.3.253. 15. Goudas M. The effects of self-talk on t hrovvin g-and j umping-events performance. Hell J Psychol. 2006;3:105-16. 16. Hatzigeorgiadis A, Zourbanos N, Mpoumpaki S, Theodorakis Y. Mechanisms underlying the self-talk–performance relationship: The effects of motivational self-talk on self-confidence and anxiety. Psychol Sport Exerc. 2009;10(1):186-92. doi: 10.1016/j.psychsport.2008.07.009. 17. Bandura A. Self-efficacy: The exercise of control. Macmillan; 1997. 18. Feltz DL, Chow GM, Hepler TJ. Path analysis of self-efficacy and diving performance revisited. J Sport Exerc Psychol. 2008;30(3):401-11. doi: 10.1123/jsep.30.3.401. [PubMed: 18648112]. 19. Stevens D, Anderson DI, O'Dwyer NJ, Mark Williams A. Does self-efficacy mediate transfer effects in the learning of easy and difficult motor skills?. Conscious Cogn. 2012;21(3):1122-8. doi: 10.1016/j.concog.2012.03.014. [PubMed: 22521472]. 20. Wulf G, Lewthwaite R, Hooyman A. Can ability conceptualizations alter the impact of social comparison in motor learning?. J Mot Learn Dev. 2013;1(1):20-30. doi: 10.1123/jmld.1.1.20. 21. Wulf LR. The optimal theory of motor learning. Manuscript submitted for publication; 2015. 22. Faul F, Erdfelder E, Lang AG, Buchner A. G*Power 3: a flexible statistical power analysis program for the social, behavioral, and biomedical sciences. Behav Res Methods. 2007;39(2):175-91. doi: 10.3758/BF03193146. [PubMed: 17695343]. 23. Chiviacowsky S, Wulf G, de Medeiros FL, Kaefer A, Tani G. Learning benefits of self-controlled knowledge of results in 10-year-old children. Res Q Exerc Sport. 2008;79(3):405-10. doi: 10.1080/02701367.2008.10599505. [PubMed: 18816953]. 24. Porter JM, Magill RA. Systematically increasing contextual interference is beneficial for learning sport skills. J Sports Sci. 2010;28(12):1277-85. doi: 10.1080/02640414.2010.502946. [PubMed: 20845219]. 25. Hatzigeorgiadis A, Theodorakis Y, Zourbanos N. Self-talk in the swimming pool: The effects of self-talk on thought content and performance on water-polo tasks. J Appl Sport Psychol. 2004;16(2):138-50. doi: 10.1080/10413200490437886. 26. Zinsser N, Bunker L, Williams JM. Cognitive techniques for building confidence and enhancing performance. Applied sport psychology: Personal growth to peak performance. 5. 2006. p. 349-81. 27. Theodorakis Y, Hatzigeorgiadis A, Chroni S. Self-talk: It works, but how? Development and preliminary validation of the functions of self-talk questionnaire. Meas Phys Educ Exerc Sci. 2008;12(1):10-30. doi: 10.1080/10913670701715158. 28. Hatzigeorgiadis A, Zourbanos N, Theodorakis Y. The moderating effects of self-talk content on self-talk functions. J Appl Sport Psychol. 2007;19(2):240-51. doi: 10.1080/10413200701230621.